Through all of the back and forth rumors of the new Porsche 911 going hybrid, I finally got a chance to sit down with Porsche itself to get a straight yes or no answer. And that answer is technically yes, there can be a hybrid 911. The stage is set for one, anyway. So I tracked down August Achleitner, Porsche’s vice president of the 911 and 718 and known as “Mister 911,” to find out more. He confirmed that the new PDK system indeed has extra space for a potential hybrid motor—that is, the addition of an electric motor to work in conjunction with the gas-driven flat-six. And that the new 911s are all built with the appropriate electronics systems that can be integrated with a hybrid system. Therefore, it seems that the new 911 is being shipped off the line with the hardware and software already in place for successful hybridization. So why haven’t we heard any confirmation about it yet? Achleitner wouldn’t go into specifics, but he did say that Porsche isn’t yet satisfied with a hybrid version of the 911 enough that would keep all of the existing “911 advantages.” He cited weight as being one of the concerns. Yet, he pointed out that Porsche has lots of know-how when it comes to hybrids—just look at the 918, the hybrid Panamera and Cayenne and the 919 Hybrid. He and another spokesperson who was listening in both denied that the current 911 platform would go electric, though. For this generation at least. I suspect that Porsche will hold out on selling a hybrid 911 for as long as it has to. It doesn’t make any business sense for it to. The 911 purists will turn their noses up at it. So unless the government forces it to make the car or it has a compelling reason to believe that a hybrid 911 will be profitable, I don’t think we can expect the car anytime soon. But on the other hand, Europeans LOVE high-end hybrid stuff, because there’s no greater apologia for buying a relatively high-emissions sports car than checking off the box to slightly electrify things. Still, though, Porsche smartly built in the possibility for itself. 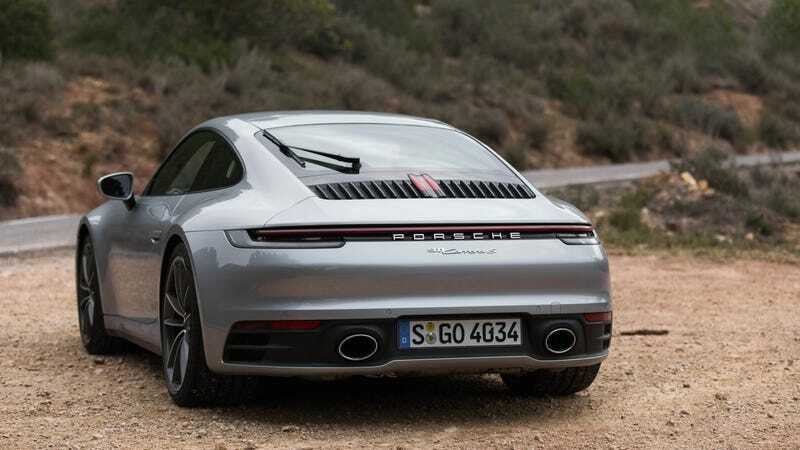 It generally takes about five years for an automaker to bring a new car to market, which means that at around 2014, someone at Porsche decided to prep the new 911 for a hybrid powertrain, just in case. Planning for the future is always a good move. It’s hard to tell where the market is going to land five years out, especially when it’s one as volatile as the automotive market. The best thing a company can do is prepare for as much as it can so that when things inevitably do change, it won’t be caught flat-footed like a certain other American automaker we all know. And here’s the thing—just because the new 911 has all the bits ready to receive hybrid treatment, it doesn’t mean that it has to actually go hybrid at all. It’s just there if the need ever arises. “It’s like an insurance for us,” Achleitner said.